You are here: Home / School Library / Spread Kindness Like Confetti with 365 Days of Wonder! 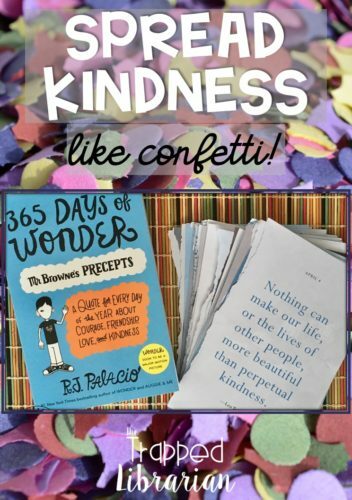 Spread Kindness Like Confetti with 365 Days of Wonder! 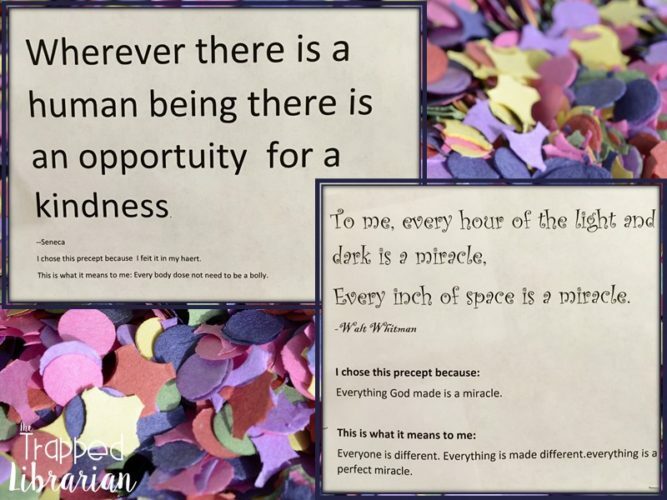 A friend shared a great idea with me for helping my fourth and fifth grade students focus on uplifting messages and positive thoughts using the quotes from the book 365 Days of Wonder: Mr. Brown’s Book of Precepts. She had torn out several pages from the book, let students choose one, and write a reflection on what the precept meant to them. I loved the idea and couldn’t wait to try it with my students. 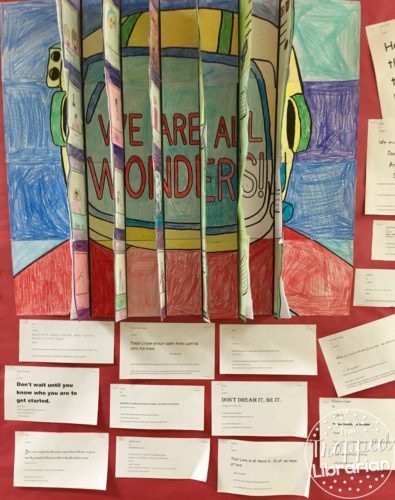 We have had some issues with bullying and unkindness at our school and I thought focusing on a book like Wonder in classrooms with some coordinating lessons in the library might help spread kindness around and I thought this activity could be just what I was looking for. This posts contains affiliate links. If you click one and make a purchase, I may receive a commission at no cost to you. First of all, in the fall, I convinced all of our 4th and 5th grade teachers to read the book Wonder by R.J. Palacio aloud to their classes while I pursued funding for a field trip to see the movie. The teachers were just as eager as I was to find a way to encourage our kids to think of others and we all believed that reading aloud this powerful book, along with the classroom discussions it would inspire, would be a great way to do it. I made sure I had plenty of extra copies of Wonder on hand for students (and other teachers) to check out (We have 10 copies in our library collection right now, and they are usually all checked out at any given time!). In addition, I also bought several copies of Augie & Me: Three Wonder Stories, 365 Days of Wonder: Mr. Browne’s Book of Precepts, and We’re All Wonders (our teachers in grades K-3 read this one to their classes) and those have all been flying off the shelves too! In case you aren’t familiar with the book 365 Days of Wonder, let me tell you a little bit about it. This book, also authored by R.J. Palacio, appears to be written by Mr. Browne, Augie’s influential teacher who often had his students write reflections on precepts, or quotes, that he wrote on the board. In this fun and inspiring book there is a precept for each day of the year, accompanied by a short narrative chapter for each month. After classes listened to Wonder and we attended the movie together, I combined some lessons on technology skills with written reflection in library classes. 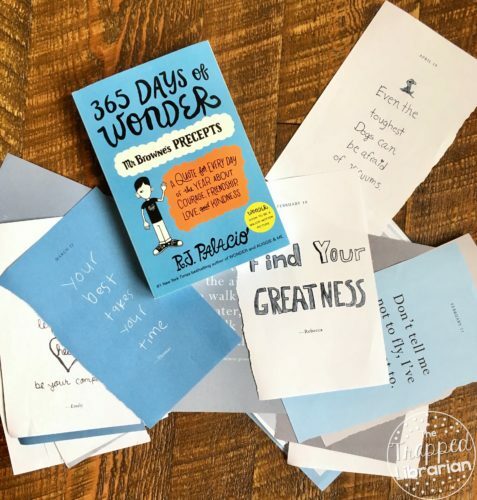 First of all, I showed students the extra copy of 365 Days of Wonder that I had expressly purchased for this purpose and everyone gasped at all of the pages that were torn out! Of course I explained that I purchased this in order to tear it apart, and warned them not to try this at home! We reviewed what a precept was and I used a quote as my example: “No man is an island, entire of itself.” –John Donne. It was a great opportunity to discuss attribution for quotes, as well as citing sources. Since our school district uses Office 365, I gave a brief mini lesson on how to access their OneDrive and displayed a prompt on the board with my quote as an example. I asked students to choose a precept that meant something to them, or that they could have a connection with. I placed a pile of precepts on each table, with extras in a central location, so no one felt like they couldn’t find something that was special to them. They were to open a Word document, type their precept, including the attribution, and then complete the following sentences: I chose this precept because… This is what it means to me… After they had all the elements complete, we learned how to format the text to change the font and size. We knew we were going to print these documents and hang them on the bulletin boards in the library to inspire the students and staff at our school, so we wanted to be sure to format the document to catch the eye of any passersby. I don’t think I was prepared for the impact this assignment had on my students and my school! First of all, the 4th and 5th graders were so proud to print and display their thoughts. We hung them around collaborative posters that each class created and the display really drew people in to look and read, and talk about what they read! One day I even found one of our staff members taking notes – writing down what several students had written – because she wanted to remember their precepts and their reflections! 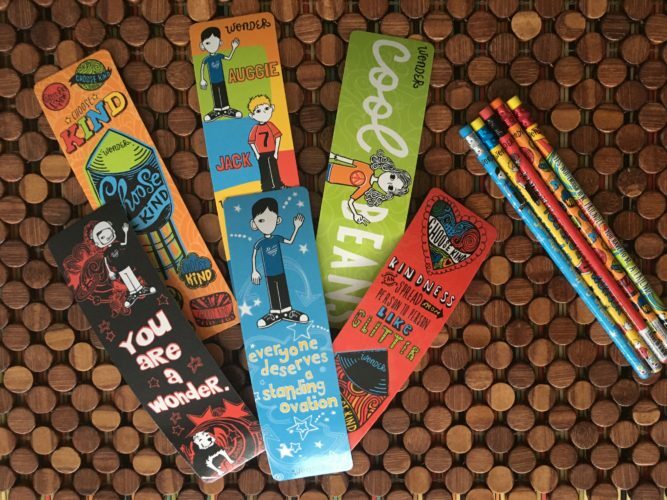 I found these fun Wonder bookmarks and pencils and gave them out to students after we completed our precept reflections. You can find them on Amazon here! 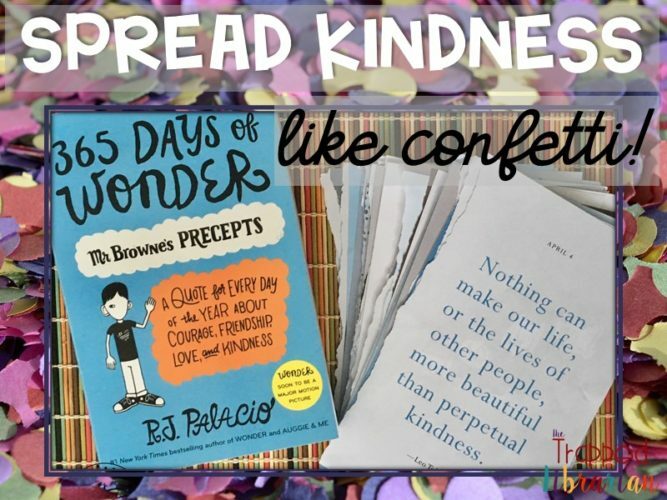 You can easily spread kindness at your school in this way – just pick up a copy of 365 Days of Wonder and get started! If you try it, let us know how it went! And if you have a fun way to spread kindness at your school, please share it below! Be well & have fun! Tech Tip: Get More Mileage Out of Your Poster Sets! I LOVE this idea! I cannot wait to try it in my Media Centers. Thank you so much for sharing. My students really loved this – let me know how it goes for you!